In 1938 Havilland H. Platt, a mechanical engineer, entered into partnership with W. Laurence LePage, whose experience in the rotary wing field was already well known: he had been an engineer first with the Pitcairn Autogiro Company, and then with the Kellett Autogiro Company. On his side, Platt was credited with various projects, among them a 'Cyclogyro' going back to 1930. This aircraft was to have lateral rotors acting like the paddle wheels of a steamship, with eccentrics to provide the requisite blade pitch variations. After abandoning this Cyclogyro, Platt conceived what he named a 'Vertogiro', a sort of helicopter in which torque was to be compensated by vanes situated fore and aft on the fuselage and arranged so that the downwash of air from the rotor should act upon them. These anti-torque vanes were to be provided with hinges to ensure directional control. This particular project was followed by the joint production of a helicopter for which Platt and LePage joined forces. The configuration chosen was that used by Professor Focke for his record-breaking 1937 helicopter. At the end of World War II, LePage had the idea of using rotors, one at each tip of the wings of conventional aircraft. These rotors would enable the aircraft to take off vertically and then, thanks to cyclic-pitch control, to continue in horizontal flight. During acceleration the rotors would tilt forward, and, tilting completed, act as airscrews. As the result of tenders called for by the United States Government for a rotary wing aircraft, the Platt LePage Aircraft Company was adjudged the best, and consequently on 19th July 1940 was given the second contract by the U.S. Army for the construction of a helicopter, the first having been given to De Bothezat nineteen years earlier. The Platt LePage prototype bore resemblances to Professor Focke's F 61, in which LePage's interest had been aroused during a visit he made to Germany shortly before the outbreak of World War II, and, in fact, Platt and LePage had already done some work on it under the designation PL-3. As the XR-1 (X standing for experimental, R for rotary wing, 1 for the first version), it had a fuselage resembling that of a conventional aircraft, and the tail was completely traditional. The engine, on the other hand, was situated towards the middle of the aircraft, and drove two rotors at the tip of streamlined pylons. The two seats were set in tandem forward. The landing gear had two main wheels and one tail wheel. The first take-off tests were made in May 1941, and those carried out later by the Air Technical Service Command at Wright Field proved quite satisfactory. The original XR-1 was damaged in July 1943. This designation was given to the second prototype of the Platt LePage helicopter. The difference between the two was that the later version had far more extensive transparent panelling. The pilot's seat was behind the observer who, because of his position in the nose, had excellent visibility. The first successful flights took place in December 1943. Impressed by the five world's records set with the Focke Achgelis Fa 61 helicopter (including a 109-km, distance record set by the noted aviatrix Hanna Reitsch when she flew from Bremen to Berlin on 25 October, 1937), a Pennsylvania industrialist, W. Laurence LePage, acquired the manufacturing rights for this experimental German helicopter in early 1938. Upon his return to the United States, LePage immediately attempted to gain the attention of the Army. After showing a film of a demonstration by Hanna Reisch in the Deutschlandhalle in Berlin to Maj Gen Oscar Westover, LePage was advised by the Chief of the Air Corps to secure the aid of the Materiel Division in the development of this machine. To that end, LePage made a presentation to the Engineering Section at Wright Field, Ohio, on 27 April. His timing proved fortunate as on 30 June, 1938, Congress passed the Dorsey Bill which appropriated the sum of $2,000,000 to enable the Air Corps to initiate a development programme for rotary wing aircraft. Encouraged by the initial response from the Air Corps, LePage formed the Platt-LePage Aircraft Co, with Haviland H. Platt as the principal stockholder, and proceeded to design the PL-3 helicopter inspired by the Fa 61. Preliminary specifications were prepared by February 1939 and in September of that year, when design work was at the threequarters mark and construction of a PL-3 prototype was at the one-fifth stage, Platt-LePage offered to complete the prototype for the Air Corps at a cost of $150,000. However, the Air Corps could not consider procuring the PL-3 on a single-source basis as it was already preparing to issue characteristics and specifications for experimental rotary wing aircraft. Draft Specification XC-147, which was issued on 10 June, 1939, and approved in final form on 25 August, called for aircraft designed to meet no specific requirement but susceptible to be modified to meet military and other federal requirements. A design useful load of 544kg and a rate of climb of at least 5m/s were listed. Circular Proposal No 40-620 incorporating this specification was published in the autumn of 1939 and a design competition was opened on 15 April, 1940. Several companies submitted bids but only four were considered appropriate, Vought-Sikorsky and Platt-LePage proposing helicopters and Kellett and Pitcairn submitting autogiros, and were evaluated by a special Engineering Evaluation Board which submitted its report on 28 May, 1940. Three weeks later, the Assistant Secretary of War granted authority to the Materiel division to negotiate a contract with Platt-LePage as recommended by the Board. Contract AC15375, which initiated the development of the Army's first helicopter, was signed on 19 July, 1940. It called for Platt-LePage to design, build, and test one XR-1 helicopter and one static test airframe for $199,075. The company immediately started the redesign of the PL-3 to meet military requirements. Delivery of the flying prototype was scheduled for January 1941. Assigned the serial 41-1, the XR-1 was completed three months behind schedule. It was powered by a fuselage-mounted 440hp Pratt & Whitney R-985-21 radial engine which drove two contra-rotating, three-blade rotors of 11.71m diameter mounted at the tips of faired pylons extending from each side of the fuselage. Of mixed construction with fabric covering, this helicopter had conventional tail surfaces with braced tailplane mounted high on the fin and a non-retractable undercarriage. The crew of two sat in tandem under a long canopy and was provided with good visibility forward and immediately below through an extended lower fuselage glazed area. All control as well as translational flight was obtained through a combination of collective and cyclic rotor blade pitch. The XR-1 made its first restrained flight on 12 May, 1941, at Eddystone and its first free flight on 23 June when it reached a height of not more than three feet and remained airborne not more than 30 seconds. During the next six weeks flights of 15-minute duration at an altitude of 4.6m were made regularly in spite of numerous teething problems, the worst of which was inadequate control. Improved control was obtained by changing leverage ratio and later by differential collective pitch change, but resonant oscillations caused objectionable reactions in control. More changes followed, but by June 1942 Materiel Command still reported considerable difficulty in overcoming vibration and poor overall control. Additional modifications were made but progress was impaired by inadequate Platt-LePage financing (notwithstanding Contract Change Orders providing for additional funding by the AAF), lack of skilled personnel, and an unscientific approach to solving the troubles in the XR-1. The XR-1 was tested at Wright Field by the Rotary Branch of the Air Technical Service Command beginning in May 1943 but was damaged on 4 July due to the failure of a rotor blade spinner. More problems were revealed during static tests as tail surfaces failed when up load reached between 140 and 150 per cent of the design figure. Damage was repaired and the tail surfaces were strengthened before trials resumed in the summer of 1944, but lateral and longitudinal control remained insufficient. 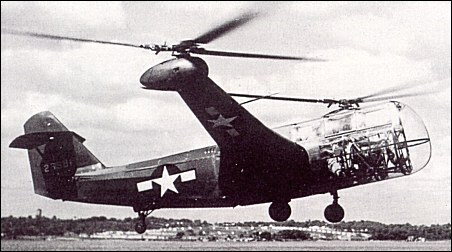 As in the meantime the Sikorsky R-4 had succesfully completed its tests and entered service with the Army Air Forces, action was initiated on 7 April, 1945, to cancel all contracts with Platt-LePage. Shortly after, the XR-1 was bailed to the manufacturer for additional trials and possible development as a civil design. The last flight was made on 21 June, 1946, and after being flown for a total of 91 hr 45 min this historic machine was donated to the Smithsonian Institution. It is now part of the collection of the National Air and Space Museum in Washington. Platt-LePage had submitted a proposal for the construction of a modified helicopter on 26 April, 1941, and this XR-1A (serial 42-6581) was ordered on 29 October, 1941, under Contract AC4609. It was characterized by revised rotor hubs with fairing around the drive system; enlarged and strengthened tail surfaces; a full Plexiglass nose covering which replaced the 'bird cage' nose and canopy of the XR-1; and the relocation of the pilot from the front to the rear seat. Powered by a 450hp Pratt & Whitney R-985-AN-1, the XR-1A was first flown at Eddystone on 27 May, 1943, and found to be smoother to fly than the XR-1. However, it still lacked adequate control and possessed surprising and unpredictable characteristics when it was delivered to Wright Field in June 1944. The XR-1A was damaged in an accident on 26 October, 1944, due to the failure of a pinion bearing support in the starboard rotor hub, and was shipped back to Platt-LePage. Declared surplus at the end of the war before completion of repairs, the XR-1A was acquired by Helicopter Air Transport Co (HAT) of Camden, New Jersey, which repaired, overhauled, and modified it for commercial use. In 1946 it received the experimental civil registration NX6950 but its subsequent fate is unknown. 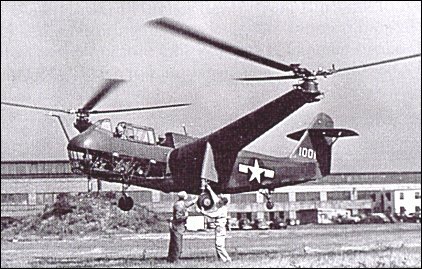 In January 1944, motivated in part by its desire to avoid further criticism from members of Congress who claimed that Sikorsky had received preferential treatment, the Army Air Forces gave a Letter Contract to Platt-LePage for seven YR-1A helicopters which, essentially similar to the XR-1A, were intended for service test. The formal contract was approved in October 1944 and the first YR-1A was to have been delivered in January 1945. However, no YR-1A had been completed when the contract was terminated in April 1945. The Platt-LePage Aircraft Co did not survive for long the cancellation of XR-1 and YR-1A contracts and was wound up in 1946. Wynn Laurence LePage, Platt-LePage Aircraft, and the XR-1 and XR-1A. A non-tilt-rotor fixeed wing craft. The first test pilot took off vertically but was too afraid to go forward. Control problems took a while. Tilt- rotor research was to follow and Frank Piasecki left the company to start his own successful company. Rene Francillon's profile of the Platt-LePage XR-1 and XR-1A coantains a number factual errors, and is woefully out of date as far as correct information on Dr. Wynn Laurence LePage, Platt-LePage Aircraft, and the XR-1 and XR-1A.